"Husqvarna Full size Ride On Mower cover for Husqvarna Ride on mowers. Made in water resistant nylon. Adjustable drawstring TO secure the cover even in windy conditions and ventilation holes. 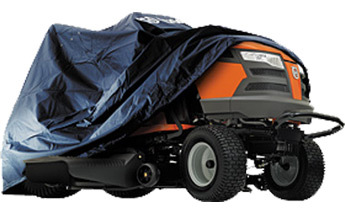 It is well worth protecting your quality Husqvarna ride on mower with this tailor made cover." Click Buy Now to purchase this product or visit one of our superstores.